Since our last construction update, IRONWORKS commercial real estate development has rapidly taken shape. 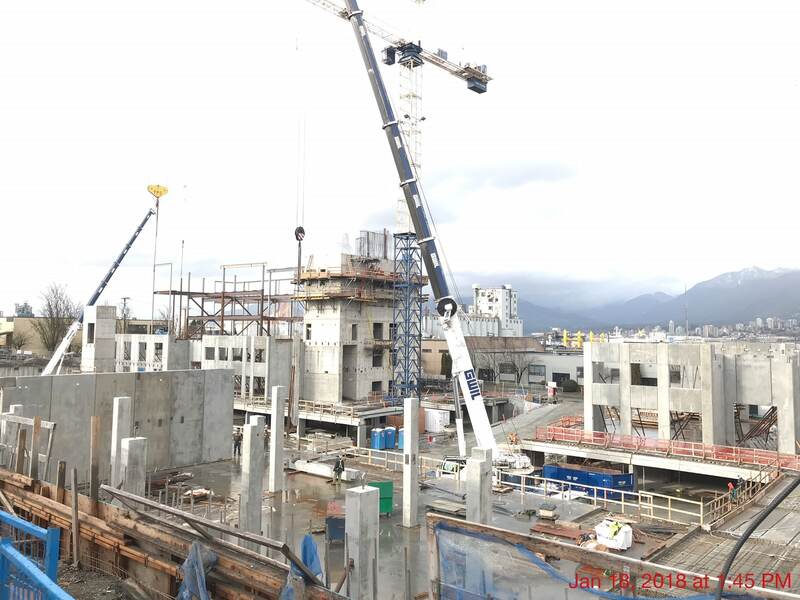 Our Vancouver Port Town construction site is a hub of activity as workers, trucks and heavy equipment are coordinated like a finely tuned machine. We are making headway on both buildings and would like to share our excitement about East Van’s newest stacked, multi-use office, industrial and warehouse space. Learn more about the innovative features that IRONWORKS offers. The Pandora Building’s pre-cast wall slabs have been fully erected. Pre-cast walls are created off site in a controlled environment that is not susceptible to Vancouver’s wet weather. Concrete is poured into wood or steel forms that, once set, are transported to the construction site and are put together with a technical assembly process. Pre-casting is efficient and reduces project slowdowns – allowing construction to continue, even in the worst weather. Phase 1 construction is well under way on the west side of the Pandora building. 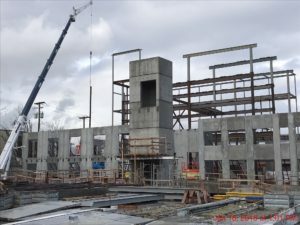 The structural steel is being erected now, and construction of the steel deck will begin the week of February 12th along with the framing of the office levels. After this month, the Pandora building will really begin to take shape. Pre-cast walls for the centre mews (between the two buildings) are being erected now. This process will continue until approximately mid-February. The mews will have a common dock loading area, individual loading for each unit, and parking for visitors. Once the pre-cast walls are complete in the mews, the hollow core slabs will be created and assembled beginning mid-February. These hollow core slabs are pre-cast slabs of compressed concrete and will become the floors in this multi-story building. The parkade structure will also be completed and closed in by the end of February. It’s an exciting time at IRONWORKS as our East Vancouver commercial development begins to fall into place and the vision of architects, designers and stakeholders becomes tangible. Stay tuned for more construction updates. If you are a local business owner considering buying Vancouver commercial real estate as an alternative to leasing, we encourage you to book a viewing today. We’ll show you how IRONWORKS unique, modern stacked design can accommodate your growing business, whether you require office, showroom, industrial or warehouse space.